It’s a common question businesses do ask and should ask before their start blogging. It’s important to understands sales can be a result of blogging. In fact, all marketing initiatives should be about profit in some shape or form. For most businesses blogging is proving to be a way to drive revenue. Recently I came across two more examples of blogs being responsible for sales. The first example is a person I’ve highlighted before – Kevin Hillstrom of Mine That Data. If you’re not following @minethatdata on Twitter it’s worth your while to add him to your stream. He’s full of in depth marketing analytics useful for marketers in all fields. Kevin was tweeting recently and I had to ask him yet again to confirm his revenue from blogging. 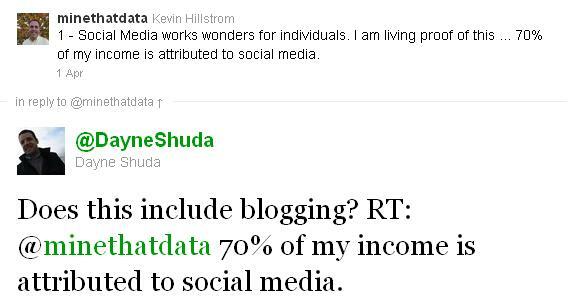 Kevin was nice enough to respond to my question on blogging revenue and generating sales. It’s important to note Kevin is a consultant. He’s a business-to-business guy attempting to generate sales from other businesses. He’s mentioned in the past and I’ve noticed in my work as well that B2B seems to be at more of an advantage for generating sales from blogging. Kevin is one example, but it’s a growing trend in the B2B world that blogging can generates sales. It’s possible for businesses to start blogs and generate sales. It’s important to understand what will gain the attention of readers and how to turn that attention into revenue. Mostly I like to think of the questions people have and try to answer the best I can. Beyond that I look to build a trust or respect making it easier for someone to purchase from me or the business I’m blogging for. HubSpot is becoming a leader in what they’ve coined Inbound Marketing – the art of gaining the attention of people through blogging, social media, and SEO. I like to think those three things go together for a great marketing strategy and I’m sure the folks at Hubspot agree. The other day HubSpot released another great article on their blog and it included some great information and a slideshow. One of the slides from the presentation captured my attention. 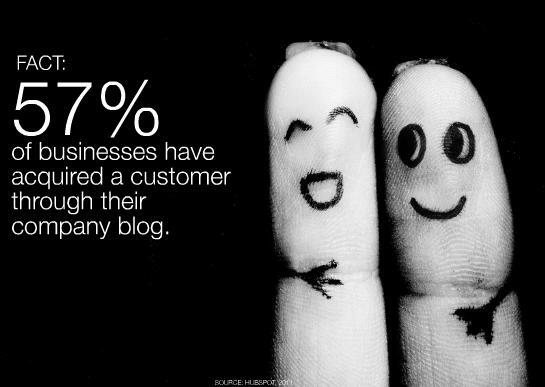 That’s a huge number of businesses seeing sales as a result of their blog. And the interesting thing about attribution lately is some channels may be under valued. As marketers work out the attribution it will be interesting to see the value blogs get in the mix for revenue generating. It’s too bad HubSpot didn’t share if their data is from B2C or B2B. With those high results I’d guess more B2B, but you never know. E-tailers are starting to experiment more with blogs and I’m sure the most successful are seeing their influence and thought leadership lead to sales. I’ll guess at some point the blogging revenue number will becoming significant to the profit for B2C companies as well. Sales are coming in for businesses via their blogging initiatives. As more companies blog in the coming years the revenue share generated by blogging vs. other channels should continue to grow as well. Companies are seeing the benefits a blog can provide to their customers and are taking the initiative to create useful content as a way to get found and build trust. What are your struggles with your blog or what is stopping you from blogging?